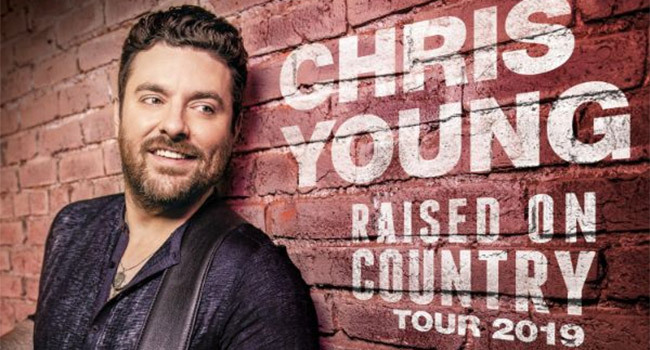 After launching his first arena headlining tour last year, multi-platinum entertainer Chris Young is excited to announce the Raised On Country Tour 2019. Sharing the same name as his “funky, rollicking, lively” (Music Row) new single, which name-checks his predecessors and country music icons Merle Haggard, Willie Nelson, Joe Diffie, George Strait, Alan Jackson and Hank Williams Jr., Chris Young’s Raised On Country Tour 2019 will kick-off May 16th in Alpharetta, Georgia. The first leg of the tour will include over 25 shows from coast-to-coast through September. Markets include Charlotte, Boston, Philadelphia, Dallas, Las Vegas, Indianapolis, St. Louis, Phoenix, San Diego and more. He’ll be joined by special guest Chris Janson as direct support along with Dylan Scott, LOCASH and Jimmie Allen. Consistently praised for his “rangy baritone and classic meets contemporary production,” (Entertainment Weekly) in just the past 15 months Young has been honored with membership into the Grand Ole Opry, included in the Country Music Hall of Fame’s American Currents exhibit, earned his 2nd ACM Male Vocalist nomination, added two new chart-toppers to his discography, totaling 11 No. 1 singles, and headlined a massive 55-city arena tour, including a hometown stop at Nashville’s Bridgestone Arena playing to a capacity crowd of nearly 14,000 fans, friends and family. The ACM and Grammy nominated singer, whose “deep, soulful vocals hold the crowd’s attention,” (Detroit Lakes Tribune) is thrilled to launch his new headlining tour in 2019. “Last year on the road was incredible and I’m crazy excited to get back out there with new music and the Raised On Country Tour and to have Chris Janson, Dylan Scott, Jimmie Allen and Preston and Chris from LOCASH join me on tour,” Young says in a press release. Tickets for Chris Young’s Raised On Country Tour 2019, promoted by Live Nation, go on sale beginning February 15th at 10 am local time. Citi is the official pre-sale credit card of the Chris Young tour through Citi Private Pass. Fans can purchase tickets now for select cities as part of Live Nation’s Country Megaticket and additional dates will continue to rollout over the coming weeks. In addition, Chris Young VIP packages will be available for the Raised On Country Tour 2019.